Talk about repurposing! Who knew a use could be found for the washed up corpses of loggerhead turtles? How eco friendly? Somehow, these “Frankenturtles” come in handy for researchers at the Virginia Institute of Marine Science. Loggerhead turtles are the most abundant marine turtles in America. But pollution, shrimp trawling, and development in their nesting areas have vastly reduced their numbers. They have been on the threatened species list since 1978. These turtles are found all over the world, except in the most frigid climates. Adult males reach approximately three feet in shell length and weigh about 250 pounds, although larger specimens weighing more than 1,000 pounds have been found. 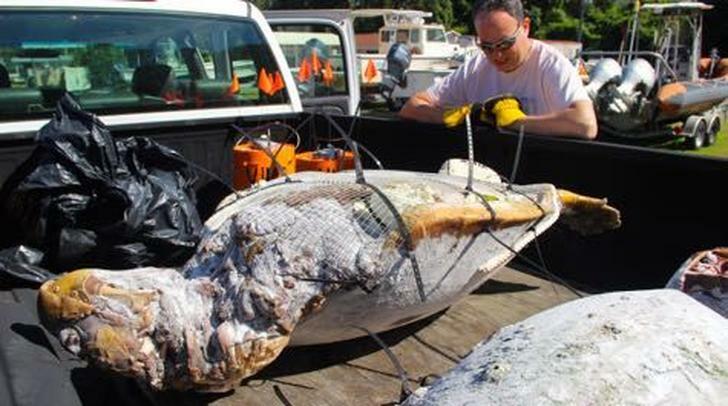 The researchers simply emptied out the internal organs of two dead loggerhead turtles that washed up on the beach, and filled the inner cavity with styrofoam. This replicated the buoyancy of a recently deceased turtle, which had been filled with gas from the decomposing materials within. Then the researchers set the dead turtles afloat, to scare the crap out of the other sea creatures. But seriously, to test the way dead turtles move in water currents, thereby to figure out where they came from, thereby to figure out what killed them. Rather ingenious, no? We only hope the styrofoam was biodegradable, and that other sea creatures do not ingest it. 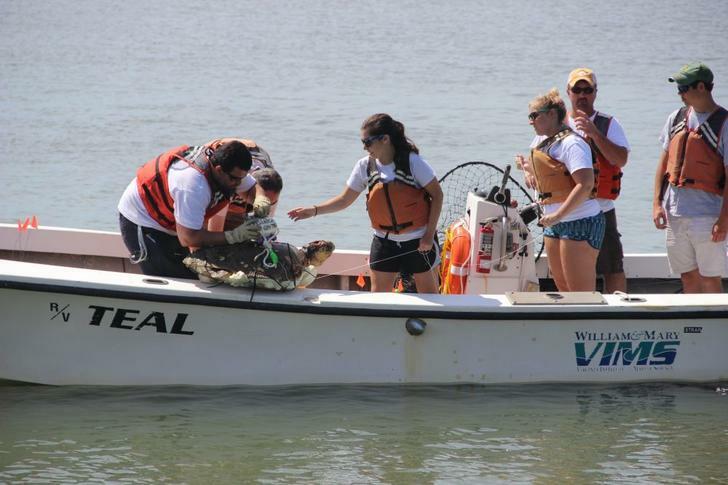 Then, researchers simply attached a GPS device to the turtles and set them “free,” so to speak, in the Chesapeake Bay. Scientists hope to configure a “turtle carcass drift model,” which would reveal how winds and ocean currents affect the movements of dead turtles. This model may enable researchers to work backward to find out where the turtles died. In so doing, they might also learn what killed them. For instance, if the turtles came from a place where fishing is a major industry, they might be getting trapped in the nets. This would mean the equipment might have to be modified to protect loggerhead turtles. Couldn't they just perform an autopsy? The turtles would otherwise have been discarded. What a novel use for dead turtles. However, ocean currents are somewhat unpredictable, and not quite so linear. It is not necessarily possible to work backwards in this way. Some people call this project a waste of time, resources, and crab food. Only time will tell. But why stop repurposing now? Maybe after the research is done, the turtles can become aircraft flotation devices. Or maybe fill them with sand and use them as doorstops.